The financial technology environment is a dynamic, high-pressured, fast-paced world in which developing fast and efficient buy-and-sell order processing systems and order executing (clearing and settling) systems is of primary importance. The orders involved come from an ever-changing network of people (traders, brokers, market makers) and technology. To prepare people to succeed in this environment, seasoned financial technology veteran Roy Freedman presents both the technology and the finance side in this comprehensive overview of this dynamic area. 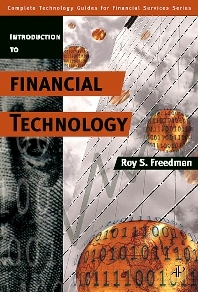 He covers the broad range of topics involved in this industry--including auction theory, databases, networked computer clusters, back-office operations, derivative securities, regulation, compliance, bootstrap statistics, optimization, and risk management—in order to present an in-depth treatment of the current state-of-the-art in financial technology. Each chapter concludes with a list of exercises; a list of references; a list of websites for further information; and case studies. Primary audience: Primary textbook for students in technical schools, career education schools taking courses in Financial Technology, Clearing and Settlement of Financial Transactions, Risk Management systems. Supplemental textbook for students in courses in MIS (management of information systems) in finance; finance, financial engineering, and software engineering. Secondary audience: Professionals new to financial technology seeking a solid grounding and overview of the area. Roy S. Freedman founded Inductive Solutions, Inc., in 1989. His primary consulting and research interests involve the practical application of mathematics, statistics, and computer technology to risk management problems in trading, operations, and compliance. He is also Adjunct Associate Professor of Financial Engineering at Polytechnic University where he teaches courses on financial technology, operational risk, technology management, and quantitative methods. Dr. Freedman has written over 60 published papers, two books, and six book chapters. He is the author of "Artificial Intelligence On Wall Street" that appears in the Encyclopedia of Computer Science and Technology (Volume 28) and is the primary editor of Artificial Intelligence in the Capital Markets: State-Of-The-Art Applications for Institutional Investors, Bankers & Traders. Dr. Freedman has been involved in assignments for the New York Stock Exchange, Merrill Lynch, Robertson Stephens, Banco Santander, Meridian Investment Company, Sun Microsystems, Tamiso & Company, Time-Warner, Chemical Bank, The Equitable, Loral, Grumman, and many other institutions. Prior to his work at Inductive Solutions, Inc., Dr. Freedman was Associate Professor of Computer Science at Polytechnic University. Dr. Freedman's professional activities include serving as editor and reviewer for several publications and being an invited speaker and teacher at many conferences and seminars. He was the Program Chairman for the first, second, and third International Conference on Artificial Intelligence Applications on Wall Street. Dr. Freedman received a BS and MS in Mathematics, an MS in Electrical Engineering, and a Ph.D. in Mathematics, all from Polytechnic University in New York City. He is a member of the AAAI, ACM, GARP, IEEE, SIAM, and SQA.